Olympic champions Argentina blanked New Zealand 3-0 in their second Pool-A match to move up to the touching distance of a quarterfinal berth in the 14th Hockey Men’s World Cup at Kalinga Hockey Stadium today. France (World Ranking 20) caused a mini upset by holding Spain (World Ranking 8) to 1-1 draw in another Pool A match of the day. Argentina now lead the pool with six points, three points ahead of second placed New Zealand with one round of matches to play. Spain and France ended the day in third and fourth position espectively. Spain and France started the day needing to recover from opening day defeats – Spain lost to Argentina while France fell to New Zealand -- and get some important points on the board. France struck early in the contest when Victor Charlet’s perfect backhand pass was guided home from close range by Timothée Clément, who changed the trajectory of the ball to give Spain shot-stopper Quico Cortes little hope of saving. The Spaniards got their equaliser early in the fourth period when Alvaro Iglesias completed a slick passing move with the easiest of finishes. Although it proved to be the final goal of game, France missed a gilt-edged opportunity to claim all three points when a penalty stroke from Hugo Geneset was brilliantly saved by a diving Cortes, cementing his position as the Player of the Match in the process. Spain’s Marc Salles made his 200th senior international appearance in this match. In celebration of the International Day of Persons with Disabilities (IDPD), before the start of the match the players of Spain and France were introduced to Guest of Honour Md Jafar Iqbal, an Odisha member of the World Cup winning blind cricket team of India. 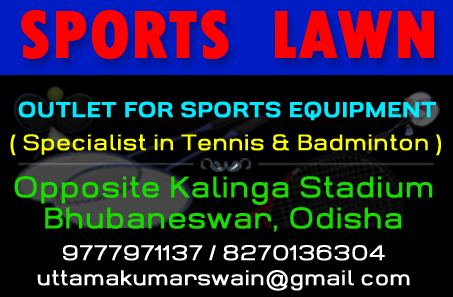 Similarly Odisha woman para athlete Jayanti Behera graced the second match of the day as guest of honour. In the second match of the day, Argentina (World Ranking 2) made the breakthrough midway through the second quarter thanks to a terrific backhand strike from Agustin Mazzilli, who picked out the top left corner of the Black Sticks net for his third goal of the competition. The Olympic champions made it 2-0 in the third quarter when New Zealand captain Blair Tarrant was robbed of possession in his on circle by Lucas Vila, who made no mistake with a blistering finish past the left hand of Black Sticks goalkeeper Richard Joyce. The match scoring was completed by Lucas Martinez five minutes from the end, who dived in to make it 3-0 from close range after Argentina’s initial penalty corner attempt had been blocked. Dec 3 (Match No 11, Pool-A): France (Timothee Clement 6-FG) drew with Spain (Alvaro Iglesias 48-FG) 1-1. PoM: Quico Cortes (Spain). Dec 3 (Match No 12, Pool-A): Argentina (Agustin Mazzilli 23-FG, Lucas Vila 41-FG, Lucas Martinez 55-PC) beat New Zealand () 3-0. PoM: Lucas Vila. 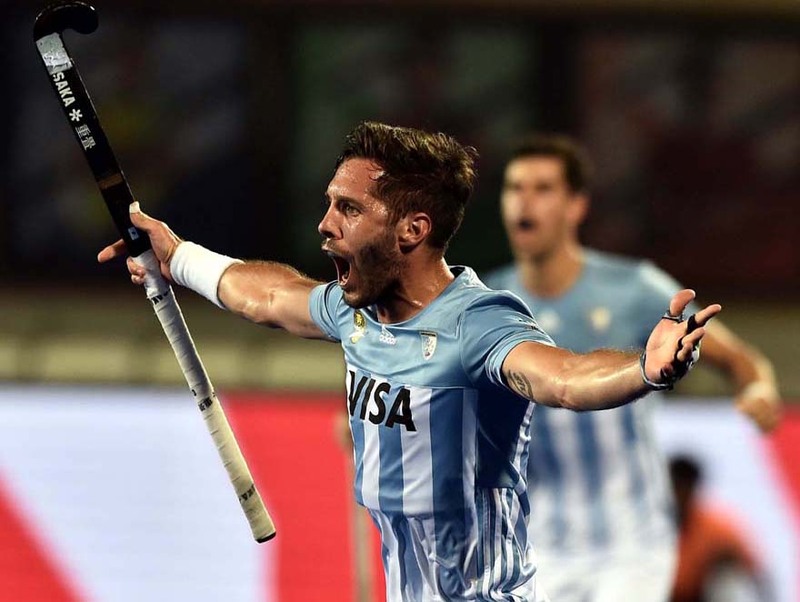 TOP: Argentina forward Agustin Mazzilli celebrates after scoring against New Zealand on Dec 3, 2018. 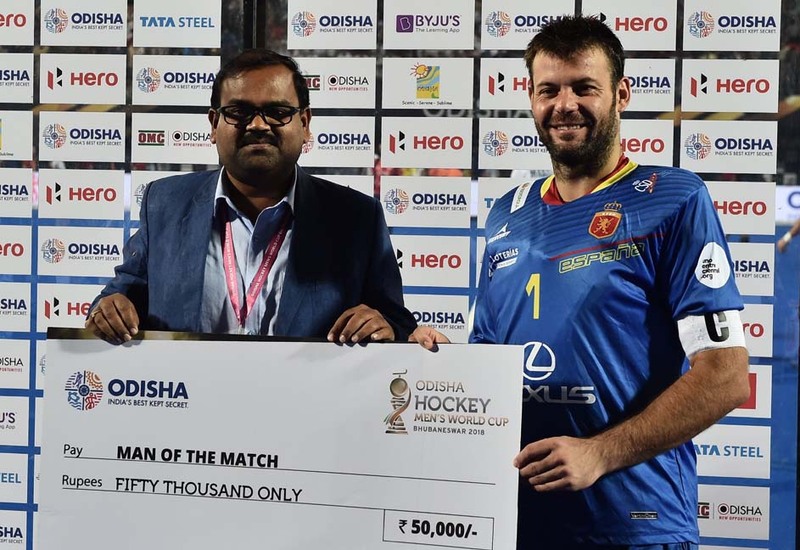 RIGHT: Spain goalkeeper Quico Cortes receives the Player of the Match award from Odisha Sports Minister Chandra Sarathi Behera on Dec 3, 2018.